See more objects with the tag furniture, trees, seating, chairs, intertwined, vegetal, lattice, silhouette, furniture designers. This is a Drawing. 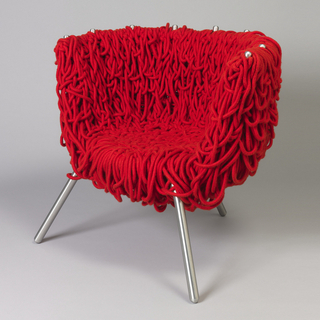 It was designed by Ronan Bouroullec and Erwan Bouroullec. It is dated October 2005 and we acquired it in 2011. Its medium is photocopy, black marking pen on white wove paper. It is a part of the Drawings, Prints, and Graphic Design department. 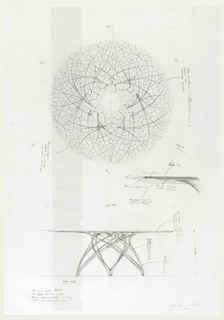 This developmental drawing by the sibling design team of Ronan and Erwan Bouroullec relates to their Vegetal Chair, which was acquired by the museum in 2010. 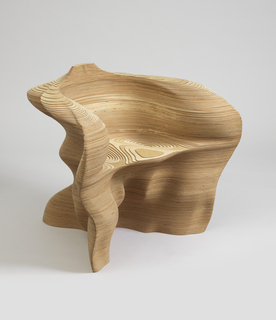 The birth of the Vegetal Chair dates back to 2006, when the Bouroullec brothers came up with the concept of a chair that “grows.” They conceived of the legs moving upwards, branching out to form the seat, and meandering up again to form the back and arms. 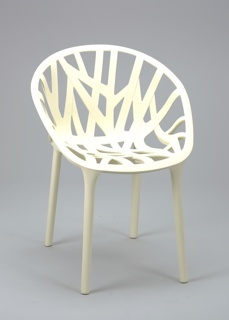 Their initial three-dimensional model was asymmetrical and led them back to the drawing board, especially to concentrate on determining the right number of branching elements and how best to incorporate a symmetrical, stable substructure for the chair to evenly support a person’s weight. They focused on the ergonomics necessary to ensure a comfortable seat and back, which they accomplished by reducing the number of branches and flattening them on the interior while retaining the branch texture on chair’s exterior. The drawing proposed for acquisition is from October 2005. It is one of three drawings from early in the chair’s development drawn in felt tip marking pen—Ronan’s preferred drawing tool. 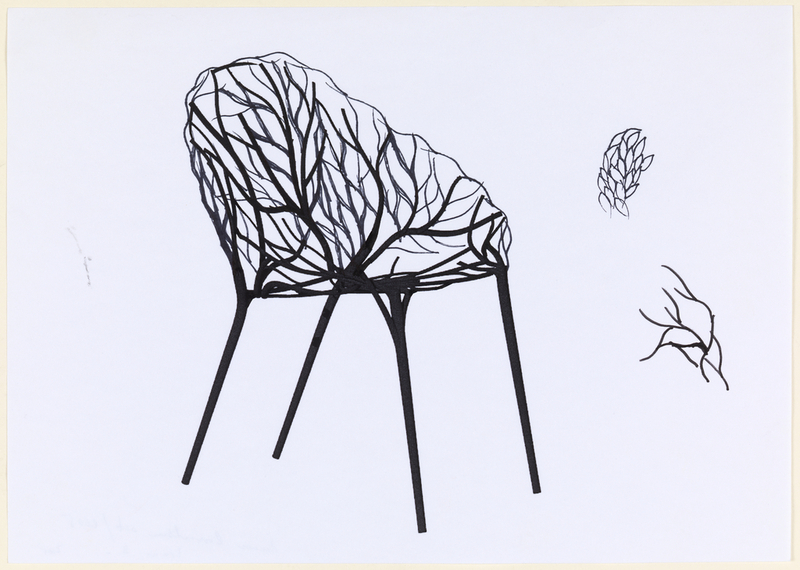 It shows the initial concept of the chair in perspective with two smaller sketches investigating the overlapping growth structure of leaves and a branching vine. 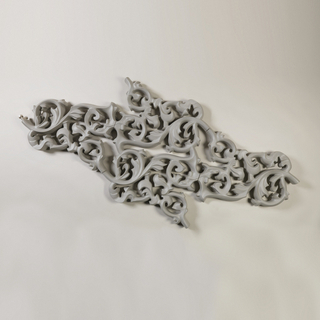 Nature has consistently been a source of design inspiration and an influence on the decorative arts. As part of the museum’s mission to explore the design continuum, this process drawing would be very useful both for pedagogic and exhibition purposes. This would be the first drawing by the Bouroullec brothers in the museum’s collection and, to the best of our knowledge, the first drawing by the Bouroullec brothers to enter a museum collection in the United States or Europe.